As the “King of Ninjas,” the Kawasaki Ninja ZX-14R ABS motorcycle was in danger of being overshadowed last year by the introduction of the supercharged Ninja H2™ and Ninja H2™R hyperbikes. 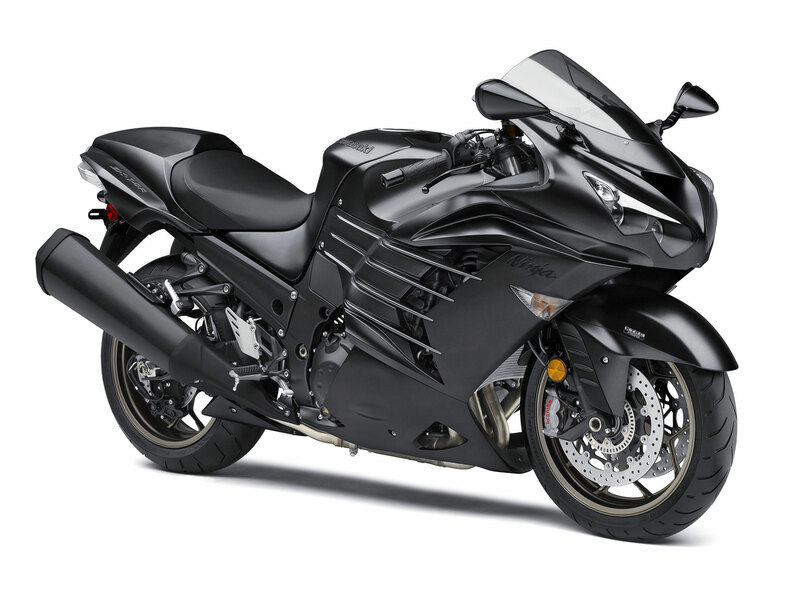 So in an effort to redress the balance and restore the king to its throne, Kawasaki has taken a number of steps to increase the appeal and ability of the most super bike of them all: the Ninja ZX-14R ABS motorcycle. 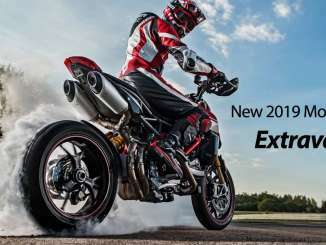 For the 2016 model year, a Special Edition will be introduced that incorporates Brembo brakes and stainless steel brake lines into its already high specification. It will also get a special paint finish and a new instrument panel, with the latter shared across the 2016 Ninja ZX-14R ABS range. 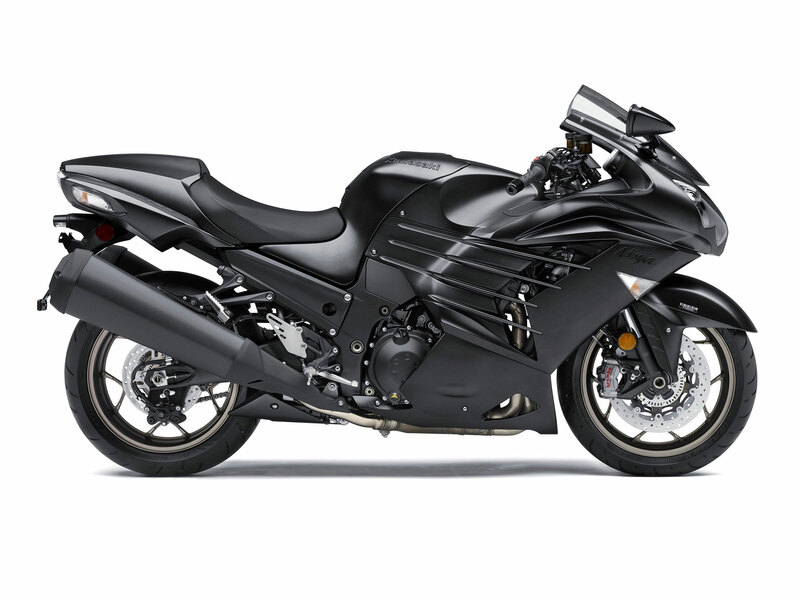 The popularity of the Ninja ZX-14R ABS supersport bike has never waned since its introduction. 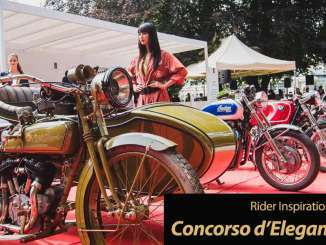 Its big displacement and big horsepower has brought big accolades, thanks largely to the muscularity of its 1,441cc inline-four. The bike is happy meandering two-up on a country road, yet is equally at home screaming down the drag strip. The secret to this Ninja motorcycle’s broad appeal comes from embracing technologies like ABS brakes and traction control that add more usability for a wide range of riders and riding styles. And that appeal will receive an extra shot in the arm with the 2016 Ninja ZX-14R ABS SE motorcycle. The new ZZR1400 Performance Sport represents an intoxicating blend of engineering, style and performance. Already King of Hypersports, this machine comes equipped with a bespoke Ã–hlins TTX rear shock absorber and Akrapovic lightweight titanium silencers plus wind cheating bubble screen. Add serious Kawasaki attitude and you have a unique performance and handling package. Note: The 2016 Kawasaki Ninja ZX-14R ABS SE is called the ZZR1400 Preformance Sport in Europe. • NEW Front rotors are 5.5mm thick, an increase of 0.5mm over the standard rotors, and include a circumferential groove to aid heat dissipation by effective increasing the surface area. Just as the iconic 1984 Ninja 900 motorcycle boasted the most powerful production engine of its day, so the 2016 Kawasaki Ninja® ZX-14R ABS motorcycle continues that tradition of impressive power, while adding plenty of torque for relaxed cruising. The 1,441cc DOHC inline-four represents the pinnacle of supersport power and performance. The character of the power delivery is as important as the peak numbers, so the surface-milled combustion chambers and polished intake ports help to spread the powerband as wide as possible. The dual gear-driven counterbalance set-up has been optimized to work with the long-stroke crankshaft, providing the legendary smooth power delivery of the Ninja ZX-14R ABS motorcycle across the entire rev range. The high-lift camshafts are operated by a high-performance cam chain and tensioner to operate reliably at high RPM, while the lightweight forged pistons are cooled by an oil jet that pumps lubricant to the underside of each piston for better cooling and increased performance. They also have extra strong alloy connecting rods with robust 40mm crankshaft main journals. The fuel delivery is precisely metered by a Digital Fuel Injection (DFI®) system that offers automatic idle adjustment to reduce emissions. The intake system uses a ram-air effect to generate more power at high RPM, while the exhaust comprises a high-performance system with large-diameter tapered header pipes and large-volume mufflers, with an advanced catalyzer to minimize emissions. The benefit is class-leading power everywhere across the rev range. The advantages are most profound in the mid- and high-RPM range, yet the 1.4-liter engine can also provide incredible acceleration from as little as 4,000rpm. This translates into the sort of thrust any rider can appreciate in a wide variety of situations. Of course, every aspect of the Ninja ZX-14R ABS motorcycle has to be capable of running with its phenomenal powerplant, so the transmission gears have been both heat- and surface-treated to help ensure strength, smooth shifting and a long service life. Finally, there is a back-torque-limiting “slipper” clutch: technology taken directly from the racetrack. It helps eliminate the wheel-hop and the torque effects of energetic downshifting while giving the rider even greater control. The most important aspect of a high-performance motorcycle is the ease with which a rider can control it, and the 2016 Ninja ZX-14R ABS motorcycle has a host of features to keep the rider in charge, many of which are developed in the competitive arena of Superbike racing. 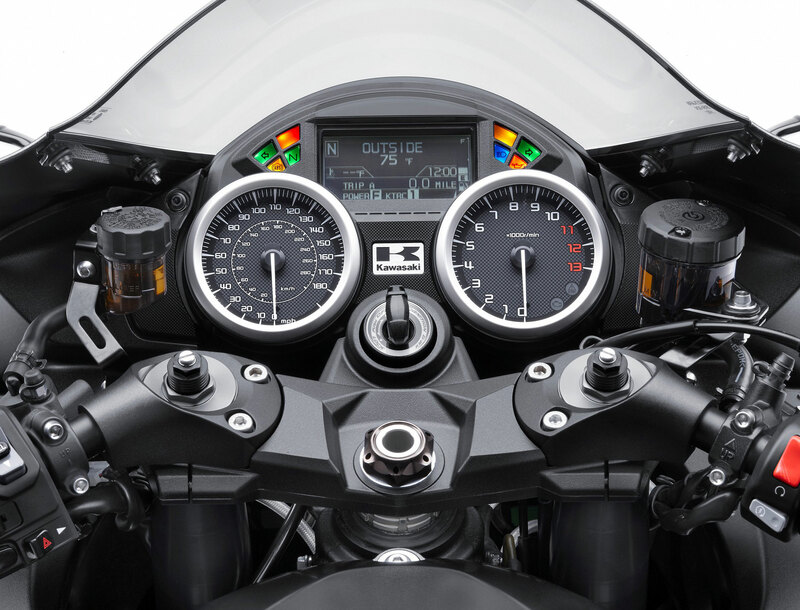 The rider can choose to select two engine power levels by using the two-mode Hi/Low power selector switch. This gives the rider the opportunity to select either full power or reduce it to 75-percent to suit the prevailing conditions. Furthermore, there is a three-mode Kawasaki Traction Control (KTRC) system, where the first two modes are intended to maximize acceleration and are similar to the S-KTRC system found on the Ninja ZX-10R motorcycle. The third mode is tuned for low-traction (wet/slippery) conditions, similar to the Concours®14 ABS sport tourer. The KTRC system can also be turned off completely by the rider using the bar-mounted toggle/push switch, which also operates the Power Modes. KTRC activity can be monitored on the cockpit’s LCD info screen. The 2016 Ninja ZX-14R ABS motorcycle features a powerful and responsive anti-lock brake system (ABS). It is standard equipment on all models and provides additional rider confidence when road conditions change. A motorcycle of this capability requires serious hardware, so the front brakes on the standard model utilize 310mm triple-petal-type dual discs with dual radial-mounted four-piston calipers. On the rear, it is equipped with a single 250mm petal-type disc and a two-piston caliper. The new 2016 Ninja ZX-14R ABS Special Edition motorcycle is equipped with the latest Brembo braking hardware, similar to the supercharged Ninja H2 and H2R as well as the new 2016 Ninja ZX-10R motorcycle. On the front, the system utilizes opposed four-piston cast monobloc calipers with four opposed 30mm pistons. They act upon a pair of 310mm floating Brembo rotors that are cross-drilled. The rotors are 5.5mm thick, an increase of 0.5mm over the standard rotors, and include a circumferential groove to aid heat dissipation by effective increasing the surface area. Brembo also provides the radial pump master cylinder and fluid reservoir, which on the SE model is finished in a smoked plastic, with a matching clutch fluid reservoir. Each master cylinder is carefully calibrated by Brembo to eliminate idle stroke so the rider will get immediate, progressive braking response as soon as the lever is pulled. This system provides excellent feel for the rider to modulate the very powerful brakes. As a final measure, stainless steel brake lines and clutch were fitted to the Special Edition model. This further improves lever feel and adds to the very high quality appearance of the motorcycle. Kawasaki engineers designed the monocoque chassis to deliver a light-handling and maneuverable motorcycle. For real sport riding performance, the frame’s aluminum castings and forgings allow unique flex and rigidity characteristics, giving an ideal balance to exploit the world-class power and acceleration capabilities of the Ninja ZX-14R ABS motorcycle. Front and rear suspension tuning helps maintain wheel control, ride comfort and maneuverability. Both the 43mm fully adjustable inverted front forks and multi-adjustable single rear shock offer excellent responses throughout a wide speed range, while the machined ten-spoke wheels reduce unsprung weight to aid acceleration, handling and suspension action. Of course, with this much top-shelf performance, you also have to look good. Dynamic styling has been a Kawasaki hallmark since the days of H1s, H2s and Z-1s, so it’s only fitting that the pinnacle of a long line of sportbikes looks the part. 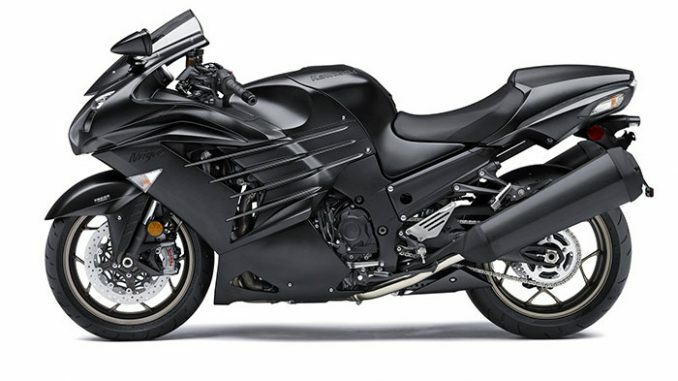 From tip-to-tail, the Ninja ZX-14R ABS motorcycle bodywork honors the imposing, angular and flowing shapes that have made recent Ninja models some of the most attractive sportbikes in existence. The front is especially imposing, with a highly aggressive nose fitted with a unique quad-headlight assembly and a large ram-air duct to stuff cool atmosphere into the intake system. The non-traditional four-fin theme along the fairing’s sides has a pronounced 3D design, while great effort was expended to hide fasteners as much as possible. The bike’s tail section is especially well sculpted, with faired-in turn signals and a removable color-matched rear seat cowl – standard on all US models – boosting aesthetic performance. The fairing package offers functional benefits as well as aesthetic ones. The seat, for instance, offers excellent thigh support and helps make it easy for vertically challenged riders to reach the ground. New for the 2016 model year is a new dashboard. It features a black dotted pattern on the speedometer and tachometer to give them a more stylish, high quality appearance. The new LCD screen can be changed from a black to white. This allows the rider to select the view they prefer or one that might read better in the ambient conditions. Using a multi-function switch on the left handlebar, the rider can toggle through the various system functions, easily scrolling through fuel consumption, remaining range, battery voltage, external temperature, traction control settings, power mode etc. Choosing and adjusting functions is just as easy, thanks to the ‘select’ button in the center of the toggle switch. There’s even an “ECO” indicator on the LCD screen that tells the rider when they are achieving maximum economy and fuel mileage. The result of all this technology and features is a dominating open-class ride – a supremely smooth, powerful and refined sporting motorcycle that will gladly go anywhere there’s asphalt, and do it with an uncanny level of competence. Sunday morning rides? No worries. Two-up along the coast for the weekend? Easy. Commuting to and from work? Simple. When the 2016 Kawasaki Ninja ZX-14R ABS motorcycle is this good at so many things, it’s difficult for a competitor’s bike to compete in the open-class category. And thanks to the powerful braking available on the Special Edition model, the Ninja ZX-14R ABS motorcycle is going to remain at the top of its class for many years to come. For the 2016 model year, Kawasaki will offer two version of the Ninja ZX-14R ABS motorcycle. The first is fitted with all the standard equipment we’ve described above, including the new dashboard layout. It will be available in Golden Blazed Green and Metallic Spark Black paint to help it to really stand out. 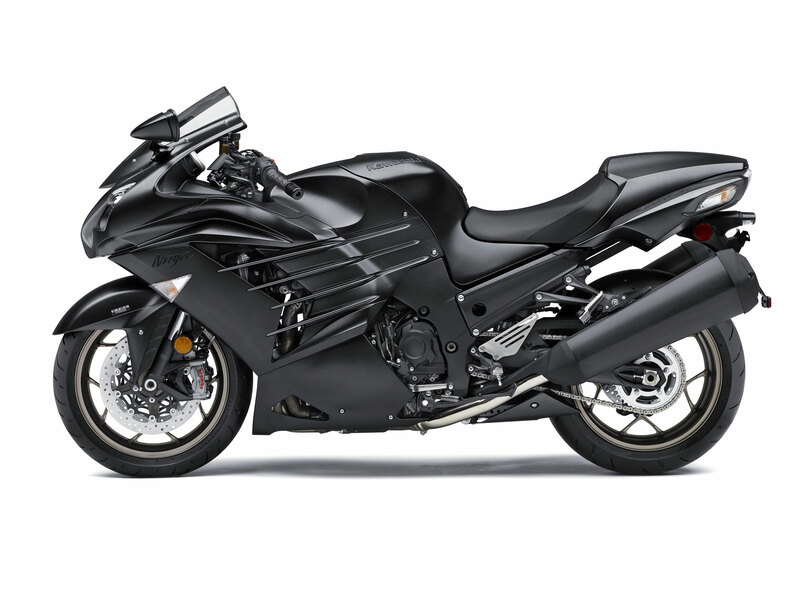 The second model is the 2016 Kawasaki Ninja ZX-14R ABS Special Edition. This comes with everything offered by the standard model, including the new dashboard, and with the addition of the new Brembo brakes and stainless steel brake lines. The Special Edition will be available in Metallic Matte Carbon Gray paint with blacked-out emblems for the ultimate stealth styling. A large selection of Kawasaki Genuine Accessories is available at authorized Kawasaki dealers. These include a passenger grab handle in both Metallic Matte Carbon Gray and Metallic Spark Black. There is also a center stand, fairing trim and deluxe cover. Completing the appeal of the 2016 Ninja ZX-14R ABS is Kawasaki’s promise to keep you running strong with our standard One-Year Limited Warranty. We don’t just want you to enjoy the Ninja ZX-14R ABS and Ninja ZX-14R ABS Special Edition, we want you to live the supersport lifestyle and be absorbed in its 31-year heritage: a heritage of performance and passion. Dual semi-floating Ã¸310 mm Brembo discs. Caliper: Dual radial-mount, Brembo M50 monobloc, opposed 4-piston.